It was a big night for Coreco on Thursday of last week as the industry Oscars, The British Mortgage Awards, rolled into town. 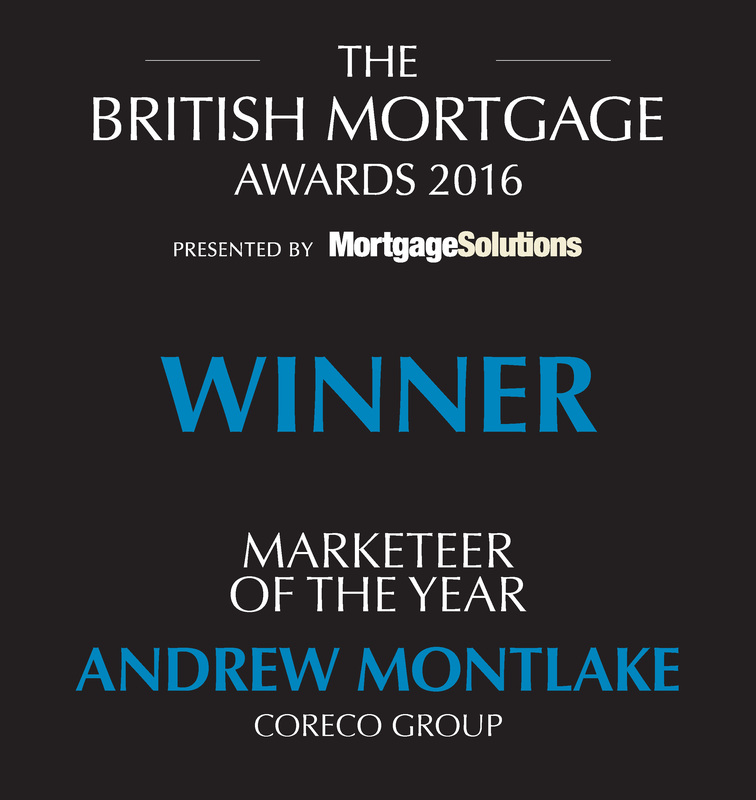 The British Mortgage Awards recognise the stand out achievements of the most deserving individuals in the UK mortgage industry. 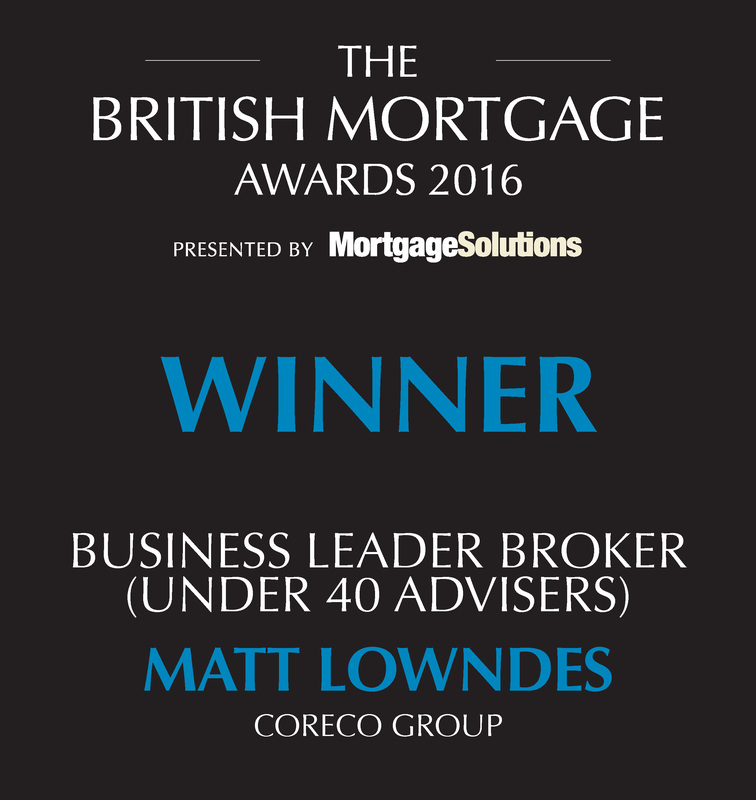 Each year the nominees and winners have demonstrated excellence in the intermediary sector. Every individual has shown a willingness to embrace change and innovate, or adapt and seize the opportunity that change inevitably creates. 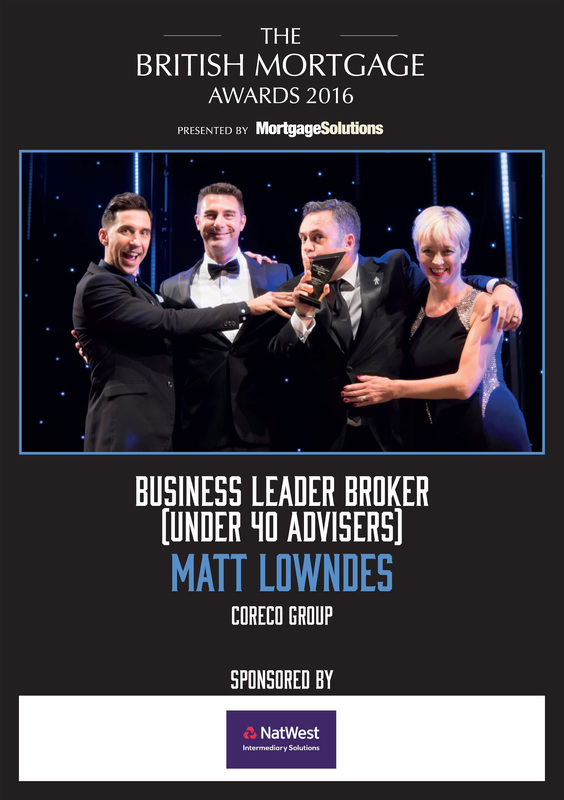 This years’ event saw Coreco short-listed for an unprecedented 4 awards in the broker categories; Best Specialist Broker, Best Large Loan Broker, Best Marketeer and Best Business Leader for a Broker with Under 40 Advisers. 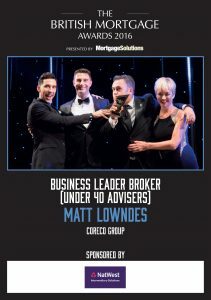 After a set by the hilarious Russel Kane, the awards began in earnest with Coreco runners-up in the early two categories with Julian Ingall in the Best Large Loan Broker category and Mark Sharpe in the Best Specialist broker category; a great achievement considering there were over 10,000 votes cast. 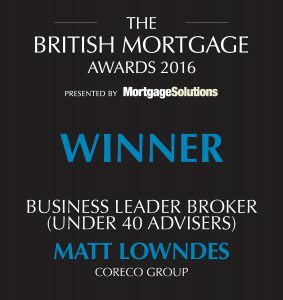 However, two of the biggest awards went to Coreco with our MD Matt Lowndes winning the Best Business Leader in the Broker with under 40 advisers category. This was a ringing endorsement for everything Coreco has achieved over the past few years, with an ethos based on outstanding customer service. You can read our Client Testimonials here. 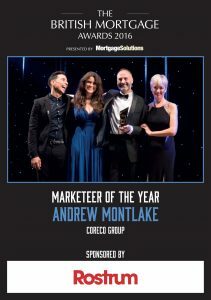 Also emerging victorious was our Spokesperson, PR and Marketing man Andrew Montlake, winning the Best Marketeer award for the second time in three years. Monty, as he is known as, has helped to create a trusted and well-known brand and was quick to pay tribute to the incredible teamwork that exists within Coreco. You can read Monty’s Blog here, check out the latest campaign video here, or look at our latest Press Coverage here. 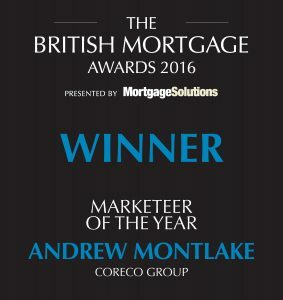 These awards speak volumes for the great team of people we have working at Coreco and highlight why Coreco is one of the most dynamic, trusted and leading brokerages in the London Mortgage market.